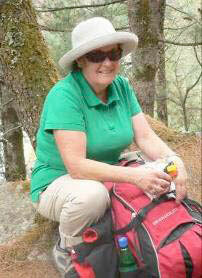 Last Trek Report – Everest, 4 April 2009 - Trekking in Nepal with Teresa, Slow Trekking for peoples of all ages. JENNI and her mum Lex along with Maxine and Kate, all from WA, were already securely ensconced at the Norbu Linka doing their own thing for a few days. I headed out to the airport on 3rd April to collect Doug and Marriane from Lara in Victoria and took them up to the Benchen Monastery’s guesthouse. Except for chanting from the gompa and some outrageously noisy barking dogs at night, it is pretty peaceful up there. Next morning we gathered up the four women from the west and then picked up the Kiwis, Jefferino (who did the trek 3 years ago), Doug and Robbie who all hail from near Masterton. The Kiwis looked pretty beat on arrival, having had two fantastic nights in Singapore with Louise, a member of Jefferino’s previous trek to Everest. The boys arrived loaded with books and toys for the Bright Future project at Kopan; ‘Thanks Louise!’. In the early evening we did a kora circuit of Swayambu. Monkeys, beggars, giant prayer-wheels, huge Buddha statues, old Tibetans in traditional clothes – it’s a real blitz on the visual senses. We had a couple of beers over dinner with Sue from the last group and my friend Jules, who lives here now, and it is starting to feel like ‘a group’. We had an early breakfast next day and then a slow walk down to Thamel. There is always a lot to see on the way – both good and bad. From immaculatelydressed schoolchildren to filthy fat pigs on the rubbish-strewn river banks, there’s a lot to see. A big breakfast at the Weizen and then ‘into it!’. This is the day for money-changing and gear-shopping. Everyone’s needs are a bit different so it is never a terribly organised day. By the end of the day though, with a dozen bags under each arm, we taxied home totally exhausted. We had registered our trek, got cashed-up with rupees and were kitted out in style. We had enough snacks to sink the Titanic, Danish pastries for next day’s breakfast at the airport and one very special cake. The trek briefing only took an hour as we planned to do a little more briefing here and there while waiting for planes, etc. We had plenty of time. The Kiwis were gagging to get to the Everest Steak House – yak steak a speciality. The rest of us tried to fit all our new stuff into our rucksacks with limited success. Early next morning, 6 April, we headed out to the domestic air terminal for the half-hour flight to Lukla. We needn’t have hurried. We waited and waited and waited. We were pretty peckish by mid-morning so we broke out Jenni’s birthday cake and toasted her with cups of tea. Half the people in the cavernous departure lounge joined in singing Happy Birthday. Happy 21st babe! Only the first flight got into Lukla and at 1.30 the flight was officially cancelled due to bad weather up there – too windy. There used to be a sign at the airport here which said ‘Please be patient if your flight is delayed due to cloudy weather – our clouds have rocks in them!’. The nearby Shambala at Kopan, where our previous groups stayed this season, had room for us so we showered and walked into Boda. Actually, it was a magical walk. We met lots of kids, saw some dancers in the street from Western Nepal and arrived at the stupa in Boda just as the sun set in a blaze of red behind the great white dome. All of Tibet seemed to be there, dressed to the nines, spinning prayer wheels and chanting ‘Om Mani Padme Hum’. After the obligatory three laps we tried the Heavenly View for a change – the name is appropriate. Will definitely go there again. Next day, with fingers crossed, we did the whole airport routine again. It really did look good there for a while; boarding passes, security, departure lounge, departure gate... too windy. After a couple of hours of ‘Delayed’ status it was o% cially ‘Flight Cancelled’. 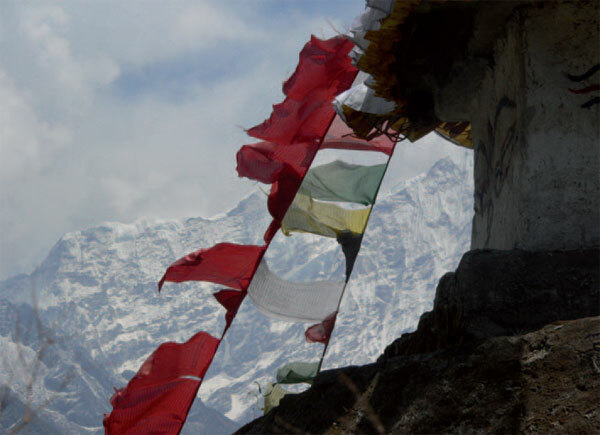 ‘LUKLA PASSENGERS DEEPLY REGRETTED’ came the announcement. I wrote this on a warm afternoon at the Shambala, again! " e Kiwis were back in " amel and the rest of us were headed up to Kopan Gompa for an evening stroll. We were on a promise of seats on the 9.20 flight tomorrow – weather permitting?? I had started to formulate an alternative trekking itinerary which was not good news for those with a strong yen for the Everest Base Camp. 8 April. Up and away. After a fairly smooth flight it was a little bumpy through the Ringjo La and then a safe landing at Lukla to a huge round of applause – I think it’s mostly relief at having survived such an amazing flight. It took an hour to round up all the boys. We had Bir, Lahar, Dorje and Purna (first time in Everest) with us. Kancha, Mingmar, Akal and Lagpa met us at the airport. Sunil was to join us on a later flight (hopefully). Our runner, Nanda, had another commitment so we took Kumar in his place. Another Lagpa replaced Sunil till tomorrow at least. 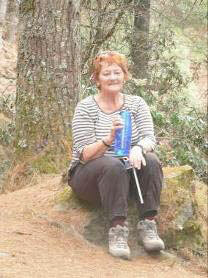 The first day was not so very hard but with newish boots and unfamiliar day-packs it is strenuous enough. The Kiwis were soon out in front but nobody else wants to hurry. These first few days take you through an intensely-farmed rural landscape with wheat, potatoes, onions and garlic already booming due to good early spring rains. The sun shone most of the day, though the first spots of Phakding’s famous evening rain were in evidence as we neared the village. Kala Pattar lodge had 20 customers so it was a cheerful dining room with folk from France, UK, Norway and Sweden. Next day the Kiwis, along with Jenni, Lex, Marriane and Doug all opted for the sti! climb up to the nearby gompa after breakfast. Maxine, Kate and I had an extra cup of coffee in the sun and a few minutes of internet time before heading off. We were reunited at Benkar for lunch. After a fairly pleasant morning, walking along the riverbank trail, it started raining and, though it wasn’t heavy, there were no views this afternoon. The Nirvana Garden lodge is always a delight and this visit was no exception. We got one clear look at Kwangde around dusk, the fresh snow looked pretty but the snow line was not that far above us. After a good dinner we played a few rowdy games of ‘Piggy’ with Nikki, a new trekking mate. Despite Bir’s reckless play the ‘Aussie’ team won – well done Jenni! Next day was our first really big hill. Everybody did really well. Even the slowest group, which included me, were in the Everest Hotel at Namche Bazaar by 1 pm. A clear afternoon afforded dramatic sunset photos as we shopped for last-minute gloves, hats, etc. The following day’s walk out to Thamo was almost perfect although we met a young porter suffering bad snow-blindness. Kate supplied a little paw-paw cream for his blistered lips and gave up her sunglasses which she insisted were ‘spare’. The young man said he could now open his eyes enough to see where he was going. Thank you Kate. Other than that it was a really good day out. We played ‘Piggy’ with Nikki again in the evening and convinced her not to climb all the way up to Thangboche. Next day we headed off to Kangzuma in sunny weather. We had changed our itinerary slightly and planned to stay at Phunki Tenga instead. It was a good plan but still a bit too easy for some of the crew. So the Kiwis, Lex and Doug pushed on up the second REALLY BIG HILL to Thangboche. We planned to meet up with them in a couple of days at Dingboche. Their plan was to push all the way up to Chhukung and possibly tackle Chhukung Ri. Meanwhile, the ‘sensible’ group paced themselves beautifully up to Thangboche next day, though Marrianne and Jenni were at the top an hour ahead of the rest of us. Perhaps we stopped to admire the view a bit too often?? Having reached Phunki Tenga the night before we were able to make Pangboche fairly easily this afternoon. Pangboche’s Sri Deva lodge is a beauty, with the best bathrooms I’ve seen on trek in a long time. The porters played cards with the customers through the cosy evening and Shiralee and Matthew were good company (last seen at Jorsale). Pity about the loud Indian man. The next day was mostly clear and we were soon peeling off layers of clothes as we climbed to Somare for a cuppa. Of course we were still just the small band of Marrianne, Maxine, Kate, Jenni and me but at the end of the long but mostly gentle climb we were re-united with the rest of the gang at Dingboche. The Imja Village is not one of the better lodges in Dingboche. I did try to find out why Dorje favours it – they certainly charged enough for the porter’s food. The response was ‘the owner is a mate of Bir’s’. We won’t stay there next time. 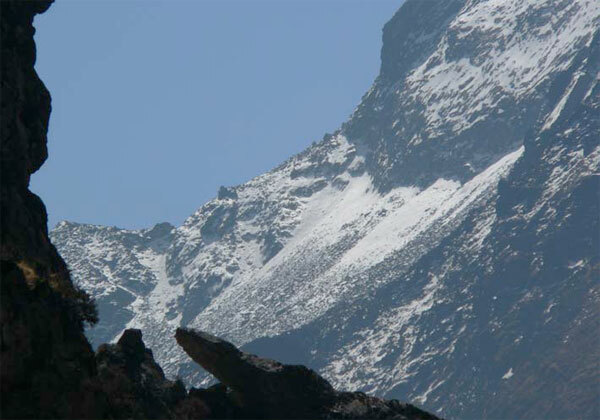 The plan for the lead group to stay at Chhukung and try Chhukung Ri had fallen through. Lex looked as sick as a dog and felt even worse. Jefferino wasn’t too flash either. There were a couple of headaches too – possibly due to the speedy ascent. The following day was as clear and beautiful as you could wish. Doug and Marrianne were soon out of sight as they walked up to Chhukung. I walked up a bit more slowly with Maxine and a slightly-recovered Lex. I had a wonderful spell at the Bibre teahouse waiting for them to come up. After a cup of tea Maxine decided that would be enough for her and headed back down with Nima (I think). The scenery was absolutely magical. Lex and I, accompanied by Purna (first time in Everest remember) and Lahar, found a very happy Marrianne gazing at the clear peaks and glaciers which surround the tiny village of Chhukung. Saw a HUGE eagle/lammergeir fly low overhead. We then got stuck into a fairly large potato fry-up while we awaited the return of ‘lamo dhai’ (tall older brother) as the Nepalis call Doug. He had taken Lagpa up to the telecom tower on the trail above Chhukung. 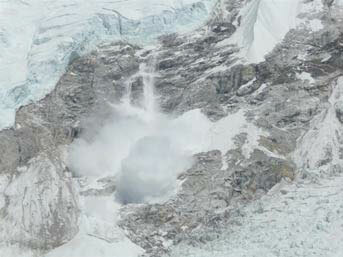 It is at least 400 metres higher than the village which is 4760 metres but he was back in an hour and a half. He was clearly emotionally moved by the wondrous scenes he was able to see from the top. Great photos too. Descending to Dingboche only took an hour as we only stopped for a breather for five minutes at Bibre. Lex lingered for a climb onto a nearby ridge – this place lures you on to see more and more. The Kiwis meanwhile climbed to Nangkarshang Gompa today, around 5000 m. We were ALL SYSTEMS GO for the next day. We made a leisurely start as we didn’t have much ground to cover to Togla. 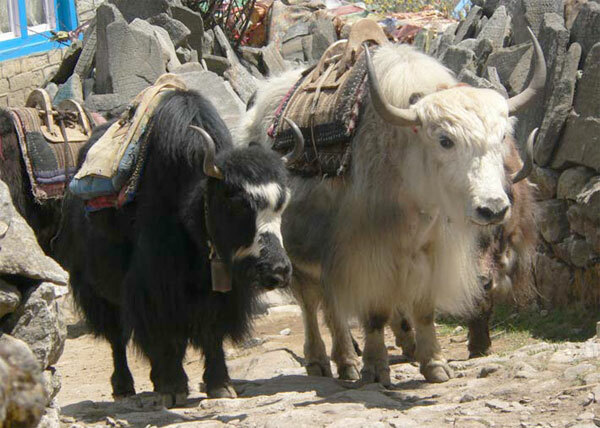 After breakfast outside in the sun, with yaks being fed and loaded nearby, we set off in high spirits. Unfortunately, Jenni was soon throwing up her breakfast on the side of the trail. Not a good sign. Tummy bug? Altitude? Who knows. The answer was to go back down and the nearest good resting place was back where we’d come from. Pheriche was probably physically closer at that point but it’s a cold and windy place. We chose the aptly-named ‘Peaceful Lodge’ and it was a real treasure. Lovely clean rooms with blankets, a cosy dining room and super bathrooms – I’m talking about white tiles! Mingmar and Lahar played cards with us till late. Mingmar won but it was great to see Jenni up and about. I think the tinned pineapple was just the shot. Next day Jenni and I made a very slow, gentle descent to our old favourite, the Sri Deva lodge at Pangboche. Weather was clear, views stunning. Hot showers OUT OF THIS WORLD!! Perhaps we would be joined tonight by some of the others from the ‘A Team’ if any of them are not enjoying the high life... I had just finished writing this when Maxine and Kate walked in the door. ‘Enough already’ was their consensus. We had a cosy night of cards. Jenni is feeling much better having eaten a little tuna for lunch and more tinned pineapples for dinner. 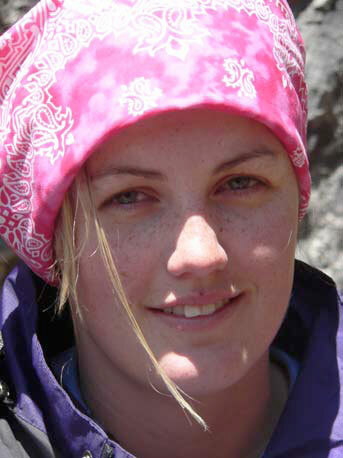 The main group became aware as they arrived in Togla that myself and Jenny had found it necessary to descend. A bit disappointed on our behalf they slept somewhat uneasily, aware that the ‘main push’ was about to happen. The sight of the Togla Pass was pretty daunting too, climbing over 200m vertically in just 700 metres of track! Phew! The two Dougs checked out trails to the west while the first really cold night descended with the dusk. Maxine and Kate decided that this was high enough and planned to descend to Pangboche to hook up with myself and Jenni next day. And their plan worked perfectly. The Togla Pass is a bit of a killer and the altitude was really beginning to register. Still, the Kiwis, Doug and Marrianne and Lex made it to Lobuche, while the two Dougs (are these guys crazy??) did a side trip to the Italian research pyramid with Dorje as well. The staff there confirmed the recent deaths of two Japanese trekkers. A solemn reminder to listen to your body and take the signs seriously. Saturday 18 April and the trek to Base Camp was hard, damn hard. The altitude was getting quite severe and I think everyone was feeling it. 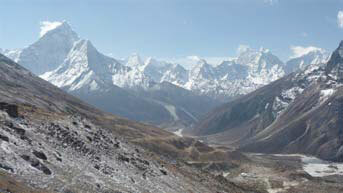 All discomfort was forgotten though when Everest Base Camp came into view. 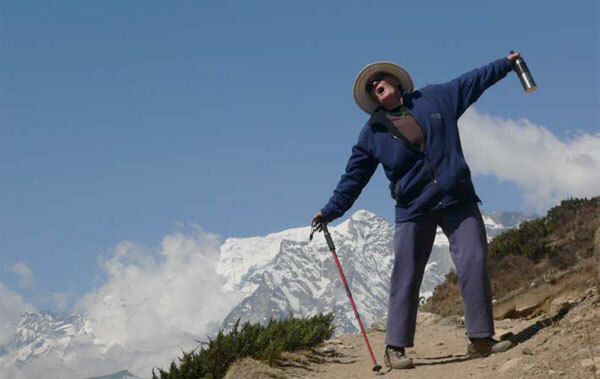 Trekking through spectacular scenery to that famous objective over the Khumbu glacier lifted everyone’s spirits. In Doug’s own words ‘the incredible scenery, the avalanches, the quietness, the beauty and the harshness of the landscape made this a fantastic moment’. 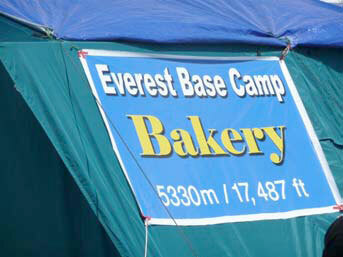 A very good apple pie was consumed at the tented base camp bakery – straight from the oven. All slept surprisingly well at Gorak Shep – pretty pleased with themselves I would say. At 5.20 am in semi-darkness on 19 April our little group set out for Kala Pattar at 5550m. 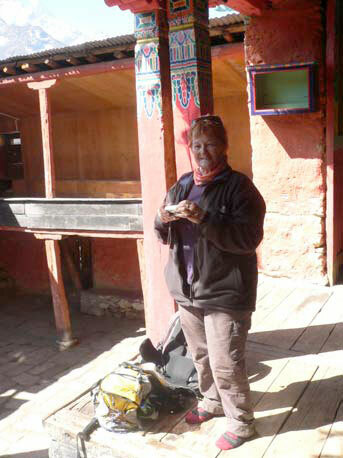 The porters surprised them en route at 5400m with hot lemon tea and biscuits. Most welcome! The sun had just risen behind Everest as the group summitted Kala Pattar. Everyone raved about the sight from the top – ‘shafts of light illuminating ice crystals being blown o" surrounding peaks’ was one comment. Each person will have their own special emotional reaction to treasure in the future – along with some pretty spectacular photos. It was a long haul back down to Pheriche, a huge day in fact – no problems sleeping that night. Meanwhile, back at the ‘B Team’, the following day, Day 12 I think, was as perfect as any so far. Bright and clear with Jenni much improved we decided to give the high trail to Phortse a go. It was a great choice. The trail is a little tricky in places but it stays really high after Upper Pangboche. This was a delightful small old village and we checked out the Gompa which was over 600 years old. 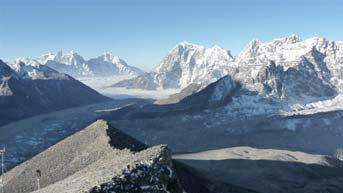 All day long the views of Ama Dablam, Kang Tega, Thamserku and then Kwangde were superb. We had an eagle’s eye view of our outward trail as we wound through crags and crossed precipitous ridges. There were no teahouses up there so we picknicked on boiled eggs and crackers. Not many people on this trail either. Phortse was a charming village, the neatest and cleanest I’ve ever seen. The Tashi Dele was brand new with a nice big, clean kitchen. ‘Jack Jenni’ won at cards tonight but we allowed the 200 rupee jackpot to ride. On the map it appeared fairly straightforward, even easy, to get from Phortse to Khumjung. Phortse 3810m, Phortse Tenga (the bridge) 3650m, Khumjung about 3750m. The Mong La (La means pass) hasn’t any height written on it on my map but I swear that ridge is at least 4000 metres. Scanning the trail from Phortse the night before I must admit the trail looked a bit daunting. We descended quickly through a hillside of Spanish moss-covered beeches and rhododendrons in mauve, pink and red. We crossed the bridge within half an hour and had an early cuppa. 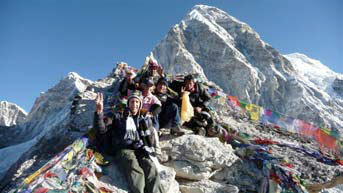 Then it was up, up, up to Mong Danda where the sign says 3960m – I don’t believe it! Potato soup and hot chocolate fortified us for the long descent. Of course, being Nepal, there was a nasty little climb at the end to reach Khumjung. I love the lodge here with its proper beds, big quilts, reading lamps and power points IN THE ROOM. We plan a rest day for tomorrow. The weather completely clouded over by 4 pm. We hoped the ‘A Team’ were having a better day above the clouds for their ascent of Kala Pattar. (Turns out they did). Next day, April 21, dawned misty and dull. Nobody stirred much before 9 am. We took our time over breakfast and washed a few smalls. We took a walk around Khumjung village and I was horrified anew at the ‘yeti skull’ to be seen at the gompa. From about 2pm onwards we started peering out of the windows hoping for the imminent arrival of our group. It was so foggy by the time they arrived you could hardly see your hand in front of your face. Wild scenes of hugging and kissing suddenly erupted in the corridor – THEY’RE BACK!! All in good condition, including porters, all made it to Base Camp and Kala Pattar. Well done Doug and Marrianne Wilson, Lex Harris, Doug Alpin, Robbi Graham and Jeff Taylor. We were shouted apple pie and cappuccino by Maxine but it was a very early night for our tired but successful ‘summit team’. There were just a few glimpses of the fabulous peaks before the cloud rolled over the hill (quite literally) this morning. As we climbed over that ridge back to Namche our clothes and hair became drenched in the swirling mist. 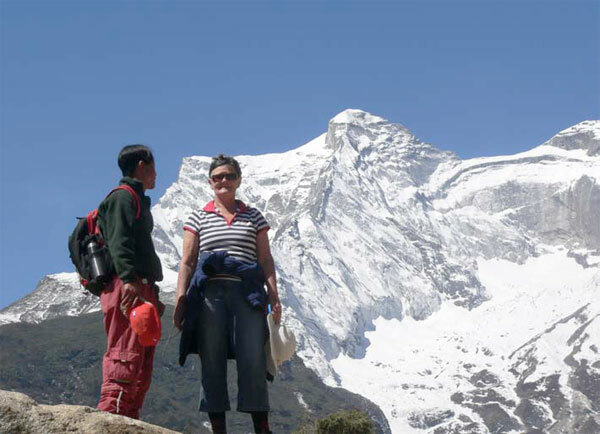 We gathered up our stored gear from Dil at the Everest Hotel and headed downhill. The huge ascent of 2 weeks ago seemed easy going down. Maxine and I got stuck behind some rather ornery yaks which slowed us down a bit. Lunch at Niravana Garden was almost over by the time we arrived. It is a long walk from Khumjung to Phakding but Dorje and Kancha arrived very, very late. The less said about that the better! Our last day was really warm and sunny, even hot at times as we retraced our steps to Lukla. 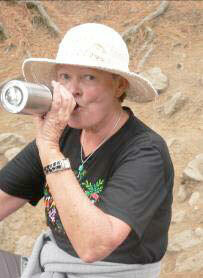 Kate, ‘Jack Jenni’, Lex and I decided to linger at Cheplung for daal soup and fresh chappati, unwilling to end our trek. We stopped by at Mingmar’s dad Hem’s local teahouse on the way into town and demolished a packet of biscuits in about 20 seconds. You really burn up the calories out there! Naturally, we visited Bir at his humble home. His handsome wife had made a space for all of us to sit in their one-room place and pots of lemon tea and boiled potatoes were passed around. The surviving twin boy is really healthy now. The oldest girl has married, in some haste, and the second daughter has just run off with her boyfriend and is living with him in Phaphlu. Bir seems philosophical. Drinks started flowing shortly after dinner and our waiter/barman/DJ kept the music and refreshments flowing all evening. At 10 and then 11 he declared ‘bed-time’ but then another great Bob Marley number would come up on Kiwi Doug’s iPod and everyone would get back on the dance floor. The Kiwi’s rendition of Meatloaf ’s ‘Do You Love Me?’ had to be seen to be believed. No problems with flights next day and really warm weather was waiting for us in Kathmandu. After a really, really long shower we headed into Thamel for some serious shopping. We showed up for dinner at the Roadhouse with complete makeovers and demolished a vast amount of pizza. As I wrote this last note, Lex, Jenni and the Kiwis were on their way to Singapore. Maxine and Kate were already on their way to China and Doug and Marrianne were enjoying the relative tranquillity of the Benchen Guesthouse for one more night and looking forward to a few nights of luxury in Bangkok. It was a truly great Everest Trek this season. I miss you all already. Thanks for coming. See you next time.